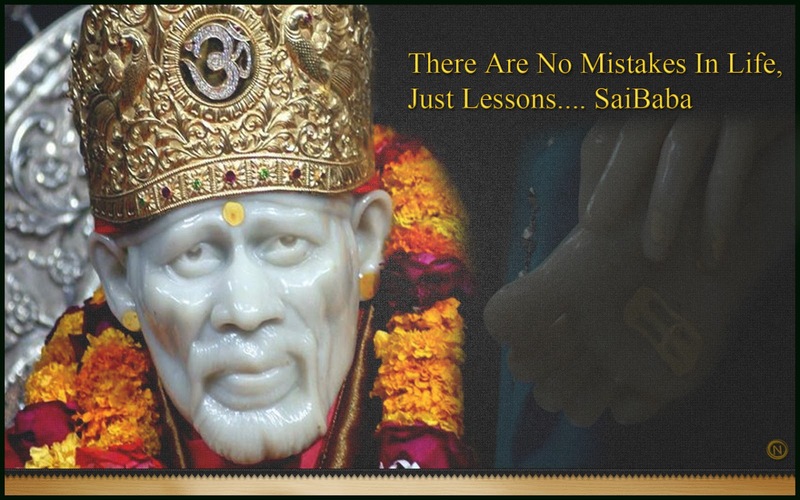 Sharing few more experiences of devotees with Shirdi Sai Baba. Anonymous Devotee from Finland says: Dear Hetal Ji, Thanks a lot for giving an opportunity to all Baba's devotee to share their experience. I always wonder and amazed at your service and dedication towards maintaining this wonderful blog in this busy world, where people even don't have time for their own family. You are blessed soul and Baba's blessing will always be with you and your family member. Please don't share my name and email Id. Infact, I wanted to share so many Baba's experience here. I am just waiting for the right time and blessings from Baba. And I strongly believe that only by His grace and blessings, I am sharing this particular experience today. This happened yesterday (April 11th 2012) and experienced now (April 12th 2012) while writing this experience. Ok now let me come to the experience. My daughter was fine (yesterday) and also slept as usual. And they were no trace of her falling sick suddenly at night. But after at half she slept, she got up coughing. When we went to lift her, we felt she was running out of temperature and she was really very hot. And once I realized that she is not well, I went to my pooja room and got Baba's UDI and kept it on her forehead and gave little in her mouth and prayed Baba like she should be fine. After this, she started sweating and slept for some time and we were so happy since our prayers were answered immediately. But our happiness didn’t last for long time. Whereas she again got up and she couldn't sleep and was awake the whole night. But I believe Baba was always with us and I say this because she didn't cry and disturb though. She was not able to breathe properly and sleep. Whole night she was awake holding my hands and seeing me. But first thing in the morning, she told Amma apply Baba's UDI in my neck. This itself was a positive sign for us to start our day and my prayers for today was she should be fine and she should have a sound sleep as she had not slept properly last night. And while I am writing this experience, she is sleeping and there is no fever. And only medicine, I gave her was Tulsi drops and Baba's UDI and nothing else. I have lot of experience to be posted and I am sure Baba will bless me to pen down those in near future. Sai Sister Payel Ji from India says: Sai Good Day to all devotees. I am Payel from West Bengal, India. This blog immensely pleases all Sai devotees and really heartiest thanks to Hetal Ji and other members of the blog. My previous experience was posted on May 4, 2012. There are innumerable times, when I felt my Sai’s presence and to describe them all will need more than hundred posts. I am sure almost every devotee finds it difficult to choose among their experiences as to which one to share. I am sharing the recent one, which I had promised to share, once my wish gets fulfilled. I was in deep trauma as my love had stopped talking to me for four months due to a quarrel between us and then even told of ending our relationship thereafter. I kept praying to Sai with full of devotion, but according to human trait, at times doubts did appear in my mind. I kept begging to Sai to find a solution and one day came across this blog, this being a miracle in itself. I read about Sai Satcharitra Parayan and completed it thrice. Each time I got certain positive indications and after completing it for the third time, my love called. All problems haven’t sorted out yet, but I am sure Baba will shape out everything perfectly. Another sweet incident occurred, when I had joined a University for teaching. It was my first day of class and I was anxious so prayed to Baba. All of a sudden a beautiful, baby pink colored bird sat outside my window. In my entire life, I haven’t seen a more beautiful bird and that too of that color. Moreover, pink is my favorite color and I know it had been sent by Baba. Needless to say, my first teaching experience was awesome. I bow to the feet of the greatest saint ever. May our beloved deity bless every one of us. Sai Brother Vinay Ji from USA says: Dear Hetal Ji, thank you again so much for this wonderful blog to share the experiences of all Baba devotees. Please do not disclose my e-mail ID (name is okay). Baba always talks about the importance of treating guests, who visit very well and this experience showed how Baba was instrumental in helping my visiting guests having a nice visit. My friends from Chicago were visiting me in San Diego for a few days, and I was disappointed to hear that it will be raining, when they are coming here. I just had a thought in my head that I will just keep a positive attitude that if it rains. It will be brief and won't spoil my friend’s visit. Most things to see and do in San Diego are outdoor activities, so it would be difficult to show them sights of the city if there was heavy rain. However, the day we went out (Wednesday), all weather reports and news websites I saw said it will be continuous rain throughout the day, but we went out anyways, hoping there will be little or no rain. Lo and behold the weather was very nice and sunny and didn't rain a bit, when we were out seeing the sights of the city. Thursday, my friends wanted to visit the San Diego Zoo, and the weather report said there will be some rain, but again the weather was very pleasant for them. Finally, on Friday they left for home, and then just after their plane took off, it was raining continuously for several hours. Somehow I know Baba must have held the rain off for the few days when they were here and then allowed it to rain after they left (since all the weather reports, weather websites and weather news stories all kept saying heavy rain for these days, but hardly a few drops came). Even though I didn't ask Baba specifically to hold off the rain, Baba gave my friends a nice visit too. So Baba devotees, remember that Baba knows all our thoughts, and even when we don't ask for something specifically, Baba gives us these kind of wonderful surprises. Let us remember Sai`s control over elements, like how Sai once ordered fire to calm down, how He orders the wind to blow calmly, how He orders the roof of the Dwarakamaayi to stop falling down till they complete their lunch, how Sai cured snake bite by ordering the poison to go away, how our Sai checked the cholera by grinding the wheat and spreading them on the outskirts of the village Shirdi. His leelas are abundant; enjoy the Amrith, the Ambrosia! On reading the last experience about treating guests, i would like to share one of my family's experience which is on the same lines. It was my engagement ceremony this Monday, i.e on 25th June. Our house is not so big and we can accommodate a max of 10-12 guests at a time. And my Mother is the only person who had to serve them snacks and refreshments, as we are not close to any of our relatives. It so happened that the guys family came and they were a total of 26 people. But Baba planned it in such a way that, they came and reached our place in batches of 10 and 5 at a time. So once one batch reached my home, my Mother served them and then they left for the temple for the engagement ceremony and Puja. SO it was easy for my Mother to handle them all well .. else it would have been a big commotion and trouble if all the 26 people had come at once.. our house could not accommodate them and my Mother would have had a tough time serving them. Only after the engagement was over, my Mother realized this Leela of Baba and was so happy. We had not thought anything about this and had not prayed about this to Baba. But he himself made arrangements and helped in making the engagement ceremony a success. Thankfully, by Baba's grace all small details were taken care of and things went on smoothly. We love you a lot Baba.. you take care of even the minute details and give us pleasant surprises. We will be ever grateful to you for all your blessings. Please bless all your children and keep your boon-bestowing hands on our heads always. Baba please do come and arrange everything for my wedding on the 9th of July.. we will be waiting for you. Please do bless us to lead blissful married life. VERY NICE EXPERIENCES...BABA PLEASE GUIDE ALL UR DEVOTEES ..SHOW THEM RIGHT PATH...LOVE YOU BABA. nice experiences. baba bless us always. just faith and patience are required. There are no mistakes in life but only lessons is very much in the most practical. The lesson one should be learnt who are pious are that be in good company always and avoid even near relatives also, who are unscrupulous and to avoid meaningless insults. All the three experiences are nice. Thanks for sharing. om sri sai ram.om sri sai ram. om sri sai ram. om sri sai ram.om sri sai ram. om sri sai ram.baba plz plz plz help me. BABA please keep shower your blessings on everyone. Love to read all experiences. Thanks for sharing. The above experience proves that Sai Baba listens even to a very small worries of devotees. All we need is pure love and devotion. Very nice experiences! It is nice that Baba helped to provide a nice visit for you guests by holding off the rain. It is wonderful the Udi helped your daughter get well and sleep soundly. Udi and faith are the best medicines. Payel Ji, it is wonderful Baba gave you those signs saying, Don't worry, I'm here with you, I will take care of everything. Om Sai Ram! Thank you all for those lovely comments. nice experiences...love you saima..om sairam..